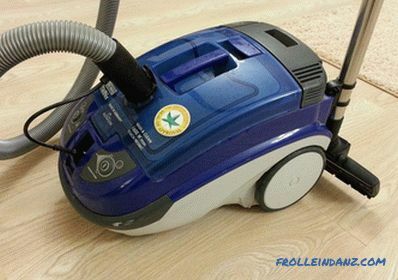 Vacuum cleaners of washing type can not only clean the rooms from dust, but also clean the floors. Indeed, in the water for cleaning added effective detergents, giving a minimum of foam. And still the similar device without effort will clean wet garbage with which the usual vacuum cleaner cannot cope. Having impressed with all these advantages, a person is ready to go shopping. Often one thing stops him: he does not know how to choose a washing vacuum cleaner. To help those at the crossroads - this article. The principle of operation of all devices equipped with the washing function is the same. They have a special container where clean water and detergent are poured. In the spraying mode, it passes through the hose under pressure to the nozzle, being distributed over its entire surface and wetting the floor. Then, under the influence of rarefied air collected from the floor surface, the dirty liquid goes through the dirt removal channels into the second tank - for dirty water. After the operation of such a vacuum cleaner, the entire surface of the floor becomes equally clean, there are no stains or spots anywhere. This quality of cleaning can be achieved thanks to the constant supply of clean water. Washed linoleum, tile and laminate dry almost instantly. After a couple of minutes, you can safely walk on the clean floor. In principle, solid flooring is clean washed with a regular mop. But to clean and freshen the carpet, returning to him bright colors, only a washing vacuum cleaner. Such devices that can mop the floor can be divided into a separate class. They, like ordinary vacuum cleaners, are able to produce high-quality dry cleaning. However, if necessary, you can always turn on the wet cleaning mode, which allows you not only to clean the floor, but also to collect wet debris. For everyday needs, especially in a small apartment, it is not very convenient to use a washing vacuum cleaner. 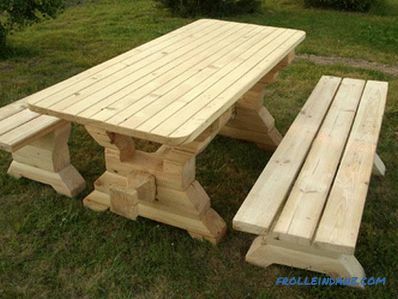 It is quite bulky and requires a lot of storage space, has a significant weight and is not able to pass everywhere. And after cleaning it will have to disassemble into parts that require washing and drying. It takes plenty of time, so owners of small premises should better look at ordinary vacuum cleaners. But it is good to use washing aggregates in those apartments or houses where the area for cleaning is large enough. They are also useful for owners of pets - such a vacuum cleaner famously collect wool, even damp. And for those who prefer to cover the floor with fluffy carpets, it will also be a good idea to purchase a similar device. Best of all, he copes with general cleaning, quickly processing large areas. However, some owners of large apartments gladly use washing vacuum cleaners, even for frequent cleaning. Ideal coatings for such appliances are ceramic tiles or stone floors. It is also convenient to use them on carpets, where the base is thin latex. Linoleum and moisture resistant laminate - two more surfaces suitable for wet processing. But the flooring, carpets on the basis of natural jute, carpet with a base of foamed materials do not like this treatment. You should take care and furniture that is afraid of moisture. In order for the vacuum cleaner to be suited for you, the minimum acceptable suction power of a washing vacuum cleaner is 300 watts. And when you need to remove very quickly, using different filters, you need a unit with a higher suction power - from 400 watts. It is possible and more - the stock never hurts. Even if the device will rarely be switched on at maximum power, then with heavy loads it will definitely not fail, i.e. there will be a divided safety margin. 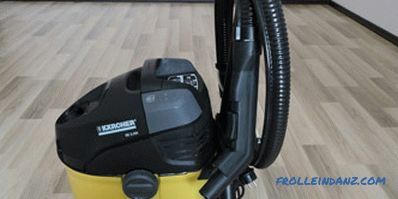 It should be remembered that it is the suction power - the determining parameter when choosing a vacuum cleaner. Do not confuse it with the power consumption specified in the passport. These are the next tricks of marketers: manufacturers of vacuum cleaners, trying to lure buyers, operate with numbers in thousands of watts (1000, 2000, 2500). However, here we are talking about power consumption, the increase of which leads to an increased power consumption. And the performance is affected by the suction power. It is at the best washing vacuum cleaner reaches only 900 watts. At the same time, it can consume much less electricity than cheap Chinese models, supposedly "super powerful." The characteristics can indicate both the average (nominal) and maximum value of power consumption and suction power. The maximum exceeds the nominal percentage value by 15-30.Usually it is possible to achieve it only at the moment of turning on the vacuum cleaner, and even then, if the working conditions are perfect. Therefore, it is better to focus on the average power. When deciding in a store which washing cleaner to choose, compare the average and maximum power values ​​of the models you like. This will help determine the specific choice. This is perhaps one of the most important details to pay attention to when choosing a device. 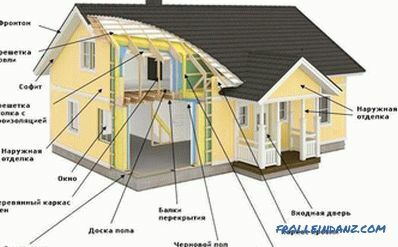 If your house has one or two rooms, then you can safely take a model with a tank from 2 to 4 liters. Three-room apartment will require a larger tank - from 4 to 5 liters. A large room of a large area will be convenient to clean with a washing vacuum cleaner with a tank of 8 to 10 liters. Otherwise, you will have to constantly run for water, changing it. This is pretty annoying - because when replacing water, the vacuum cleaner must be disassembled every time. 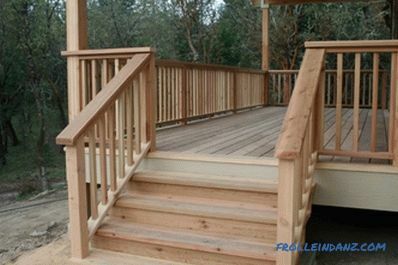 It is better to immediately buy a model with the parameters corresponding to the cleaned area. We did not mention the second tank in which dirty water is collected. The fact is that its volume is not necessary to take into account when choosing a vacuum cleaner. As a rule, it depends on the volume of the tank for clean water. Getting into the tank with water, the mousse is moistened, becomes heavy and settles at the bottom. But not all - from 5 to 10% of light dust particles safely avoid this fate. 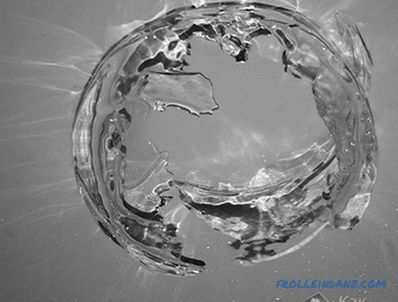 They are saved by air bubbles, inside which they fall. Emerging along with these bubbles to the surface, fine dust remains dry and unharmed. But in front of her waiting for fine filters (the same as in the dry-type vacuum cleaners). Usually these are AFS, S or HEPA filters. Best deal with the task of the device with aqua filters. They perfectly capture large particles of dirt and dust that drown in water. This cleans the air that enters the room. However, even the aqua filter is not omnipotent - and it misses from 1.5 to 2% fine dust. Help her to "catch" coal HEPA and S fine filters. They serve at least a year (some models are several years old) and require only periodic washing under a tap. According to the standard EN 1822, the HEPA filters used capture 99.5% of particles as small as 6 microns. S filters according to DIN 24184 remove dust particles as small as 3 microns in size - this is 99.7% of impurities. Let us consider in more detail the classes of HEPA filters, whose efficiency is usually determined according to the standard EN 1822. 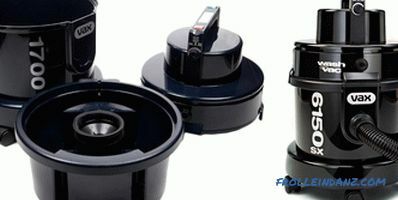 A number of models of washing vacuum cleaners in the design has a separator capable of trapping small particles of dust. After all, as we remember, they "hide" in air bubbles. 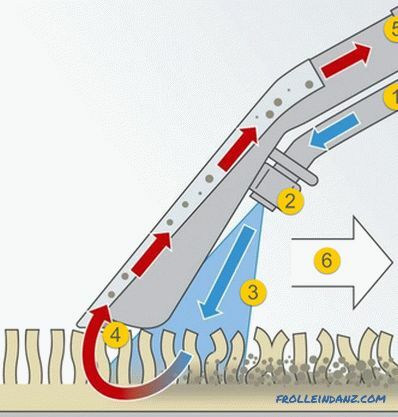 The separator corrects this deficiency - when it quickly rotates, a fine water suspension is formed, which detains even microscopic dust particles. Air purification efficiency rises to 99.97%. Before buying the model you are interested in, be sure to ask what kind of filtering system is installed there, this is especially true for people with allergies. Modern vacuum cleaners are equipped with telescopic tubes. They are convenient because they are easily regulated, therefore they are suitable for a person of any height. The "advanced" models have a control panel on the handle, which is very convenient. Method 1 - wire type control. Wires are laid inside the hose, connecting the vacuum cleaner and its handle. This is the most budget option, it is used quite often. He has a negative point - the wires noticeably heavier the hose. Method 2 - infrared control. Here the principle of operation is the same as that of the remote television remote control. No wires, you just need to insert two batteries into the remote. But sometimes the signal to the vacuum cleaner does not reach, lingering on the obstacles. This could be, for example, a sofa or a wardrobe. Method 3 - radio control. This method is convenient, efficient and error free. It is tempting to choose a washing vacuum cleaner for the house on the radio, but this type of model still produced very little. And they are expensive. Vacuum cleaner tubes can be made of steel, aluminum or plastic. The latter are cheaper than others, but they are not so durable. The most reliable and strong - steel tubes.It is very convenient to use telescopic type disassembling tubes, but they have a significant drawback: gradually loosening connections begin to pass water. You can, of course, use long solid tubes, but they are not very convenient to use. Usually, a vacuum cleaner has a set of such nozzles from five to seven. This is a device for dry cleaning, which has modes "floor" and "carpet", as well as nozzles for cleaning floors, for cleaning furniture, and for glass cleaning. Sometimes there is a plunger. Wet cleaning is usually done with a basic nozzle intended for cleaning carpets. 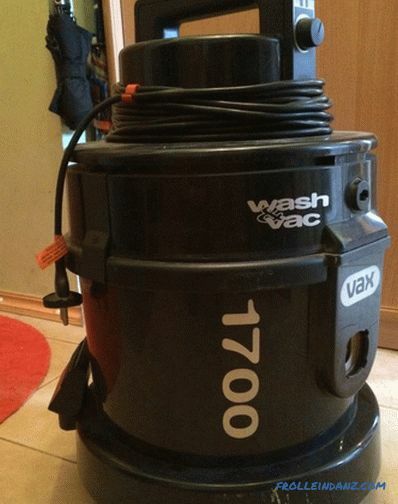 A special adapter is put on to wash hard flooring. Even for wet cleaning use a nozzle for cleaning upholstered furniture and small planes, as well as a brush for hard surfaces. Dry cleaning implies a universal brush, in which the height of the pile can be adjusted. It is suitable for any type of surface. 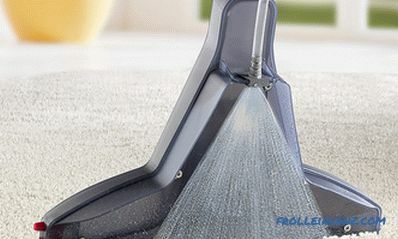 A small brush will allow you to reach hard-to-reach places, and a crevice nozzle cleans the furniture. In general, the choice of nozzles and accessories is very large, but it all depends on manufacturers. Each of them, competing with each other, creates its own adaptations or improve old ones. To describe them all is not possible, but some of them should pay attention. 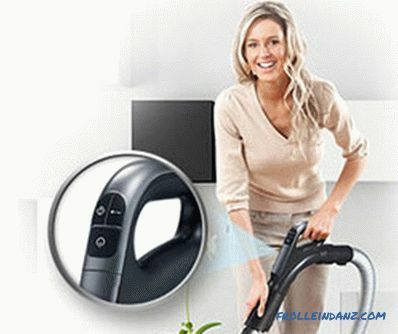 VAX manages its vacuum cleaners with a special anti-static brush that is convenient to clean a computer monitor, keyboard, or television screen. 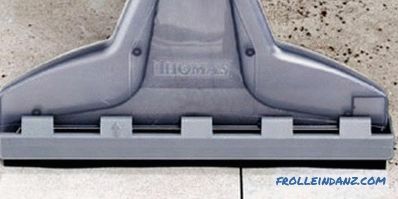 And the nozzle-plunger will help the THOMAS vacuum cleaner to even clean the sink quickly. Convenient fixtures manufactured by ROWENTA. So, the Swip nozzle easily removes dust from the slats of the blinds and keyboard, and the Wip nozzle made of soft foam does not damage the polished furniture or the TV screen. 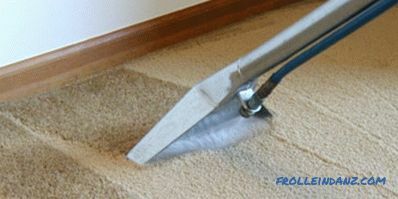 This manufacturer also took care of upholstered carpets by preparing a turbo-brush for them. The hard coating nozzle has a special brush brush that can be used for scrubbing the dirty floor. Working with her reminds washing the floor with a mop, but it turns out better. After all, clean water is constantly supplied, and the dirty water is sucked into a special tank. Here it is worth praising the PHILIPS nozzle, which will clean the dirt that has dried to the floor, will thoroughly wash the floor at once, and collect all the dirty water. However, it has a very economical consumption of clean water. If you need to wash the window panes, window nozzles made by ROWENTA and PHILIPS will be useful. Firms DELONGHI and LG went the other way - for this case, they produce nozzles-rollers. On the one hand, they have a sponge with which the glass is wetted, and on the other, a rubber scraper that removes dirt. In this way, it is possible to clean both mirrors and various ceramic coatings. To decide which one to choose a vacuum cleaner for a house or apartment, you need to navigate in the sizes of different models. The washing units happen horizontal and vertical execution. The last option is a classic. Such models produce ROWENTA, DELONGHI, THOMAS, VAX. And the very first washing vacuum cleaner was exactly vertical. This device looks a bit like an automatic bucket. Its body looks like a cylinder or a trapezoid, and an engine is located above the water tanks. The cylindrical vacuum cleaner is heavier and larger; its water tanks are more capacious. These devices are used by professionals, they are suitable for a large apartment or house. If the bulky vertical model is not to your taste (or maybe you just have no place to put it), then you can purchase a more compact vacuum cleaner. Outwardly, he is very similar to his younger brother - a device for dry cleaning. Its elegant design fits well with the style of modern apartments, and its good maneuverability allows it to be used even in small spaces. Each time after work, the washing vacuum cleaner should be disassembled and washed, so manufacturers tend to make disassembly disassembly simple and fast. If everything is arranged rationally and correctly, then this process will not take more than 15 minutes. And those models in which the parts are uncomfortable, have a long time to disassemble and assemble. Much in this regard depends on the location of the water tanks. For example, VAX has a clean water tank on top, and below it is a waste liquid tank. To drain it, you need to remove the upper container - it is long and not very convenient. But the often used “tank in tank” design is quite simple to use. Here, the lower part of the body simultaneously serves as a tank for dirty water. She has a removable tank with water and shampoo for cleaning. 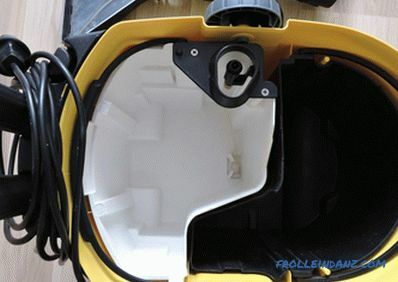 To fill it, you need to open the side latches and remove the tank. THOMAS and KARCHER produce vertical models in this version. ROWENTA has developed a slightly different design - a one-piece tank consisting of two cylinders inserted one into the other. The inner cylinder for clean water can be filled several times, and then pour out dirty water. With a large amount of work it is very convenient. And if you have to remove a small room, enough of one serving of clean water and shampoo. Washing units are no more “loud” than ordinary vacuum cleaners. If the device is made to the conscience, and its parts are of high quality, then it will not make much noise. Models of famous brands have a noise level no higher than 60-65 decibels. This figure is less than the washing machine. However, short-term operation of vacuum cleaners makes their noise level is not so significant parameter. Calculate the range of the unit, adding the length of the hose, tube with a brush, cord and body. It should be at least 7 meters. Automatic cord winder is a necessary feature. 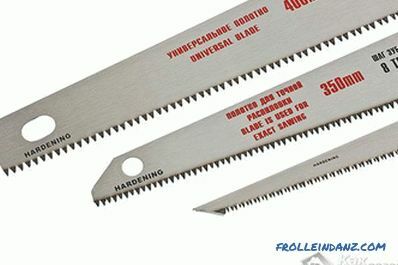 Too sharp winding is unacceptable - it is fraught with injuries. The engine should have auto power off at overheating. Also, overload protection is necessary - in many models, this is the function of a smooth start. 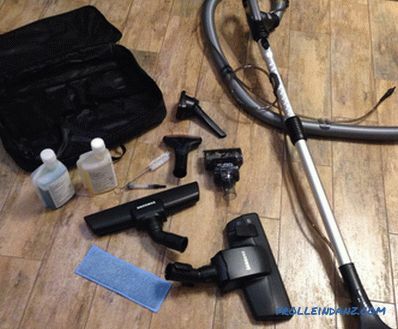 Washing-type vacuum cleaners can make a house much cleaner. It is especially useful to use them where allergic persons and pulmonary patients live. Now, having studied the theory, you know how to choose the right vacuum cleaner by its technical characteristics and its needs. You can safely move on to practice.